Approximately 17 x 24.5cm. 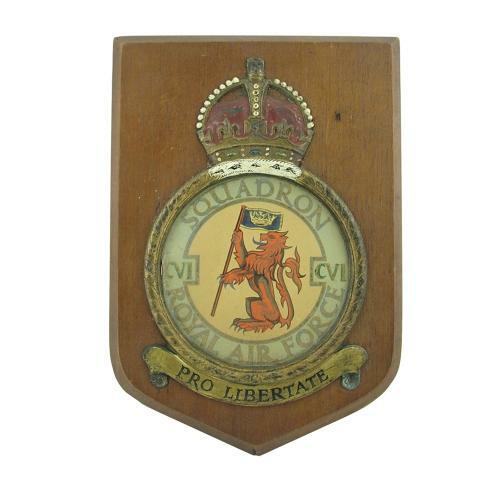 Wooden shield with a 106 squadron crest. The King's crown, surround and scroll with squadron motto are all cast in metal and hand painted. The squadron badge features a lion sejant, rampant, holding a banner charged with an astral crown. The latin motto reads 'Pro Libertate' (For Fredom). The crest is based in that of the County of Doncaster in Yorkshire, the squadron being stationed near there at the time of adopting the badge. The entire badge is hand painted and covered with a disc of clear perspex. The plaque shows age related wear but is in very good overall condition. 106 squadron flew as part of 5 Group and had Guy Gibson as CO prior to the dams raid. A very nice vintage plaque, not to be mistaken with the more modern mass produced examples. Stock code M23064.